Joseph Prestwich FRS, (12 March 1812–June 23, 1896) was a British geologist and businessman, known as an expert on the Tertiary Period and for having confirmed the findings of Boucher de Perthes. Born at Pensbury, Clapham, Prestwich was educated in Paris and Reading before entering University College, London where he studied chemistry and natural philosophy. Whilst a student he founded the short-lived Zetetical Society. In 1830 he began working for the family wine business. This job required him to travel throughout the United Kingdom and also abroad to France and Belgium and during the course of these travels he made many geological observations. He became a Fellow of Geological Society in 1833. His 1836 memoir on the Geology of Coalbrookdale, based upon observations made during 1831 and 1832 established his reputation as a geologist. From 1846 his attention focussed upon the Tertiary deposits of the London Basin, which he subsequently classified and then correlated with Tertiary deposits throughout England, France and Belgium. In 1858 Prestwich was persuaded by Hugh Falconer to visit Abbeville, where Boucher de Perthes had claimed to have found flint tools in the gravel deposits of the valley of the Somme, thus establishing the antiquity of man. In company with John Evans, Prestwich visited the gravel beds of St Acheul and confirmed the observations of Boucher de Perthes. Prestwich's report on the matter was published in the Proceedings of the Royal Society for 1859-1860: It is claimed by some authorities that this publication marks the birth of modern scientific archaeology. During the late 1860s Prestwich served on the Royal Coal Commission and the Royal Commission on the Metropolitan Water Supply. 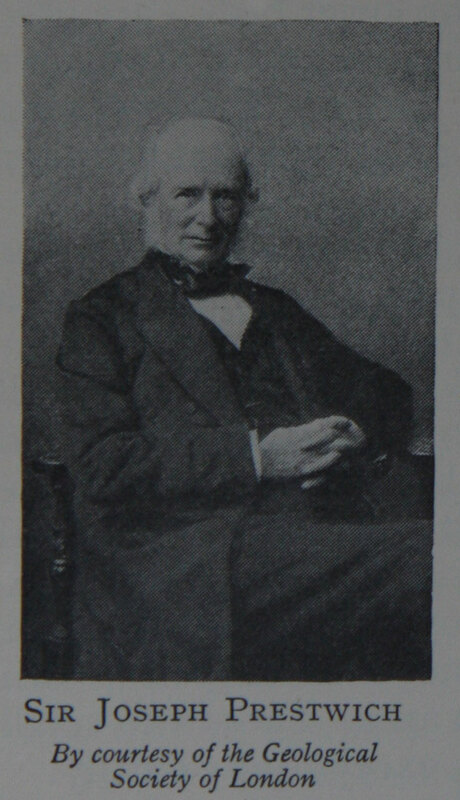 In 1874 he was appointed to the chair of geology at the University of Oxford. Here he produced in two volumes Geology, Chemical and Physical, Stratigraphical and Palaeontological. In 1888 he retired from Oxford to Shoreham in Kent where he continued to work until his death in 1896. Prestwich was elected a Fellow of the Royal Society in 1853, awarded its Royal Medal in 1865, and knighted in 1896. He married Grace Anne McCall in 1870. SIR JOSEPH PRESTWICH, M.A., F.R.S., full of years and of honours, passed into rest on the 23rd of June, 1896, after a life of unceasing activity in many widely different spheres. In his grave, in the little secluded village of Shoreham, in Kent, lies the last of the band of men who made geology a science - Buckland, Murchison, Sedgwick, Lyell, Phillips and De la Beche - and did their work so well that there is little left for the present generation but to fill in the details. Born on the 12th of March, 1812, at Clapham, and educated partly in London and partly in Paris, Joseph Prestwich received his first scientific impulse from the lectures of Dr. Turner and of Dr. Lardner at University College, Gower Street, where he gave special attention to chemistry and natural philosophy, including geology and mineralogy. When a mere boy he came under the influence of the founders of the Geological Society, which he joined in 1833, at the age of twenty-one. He contributed to the Transactions and Journal Papers on various geological questions, from early in the thirties to the closing decade of the century. These Papers, and more particularly the earlier ones relating to the classification of the Tertiary strata of Britain and France, give him a place in the annals of geology by the side of Sedgwick, Buckland and Murchison. What they did for the Primary he has done for the Tertiary Rocks, although until he was sixty years old he was in business as a wine merchant and was unable to give his whole time to scientific work. In one respect his business furthered the study of geology by taking him over the greater portion of eastern and southern England and a large part of France. In his journeys he acquired the minute topographical knowledge which characterised his geological writings. His holidays were devoted to various special lines of inquiry. The memoir which he wrote for the Geological Society in 1836 on the geology of Coalbrookdale was the fruit of two years’ holiday. It at once placed him in the high position which he held in British science to the end. Of his many contributions to geology it is not possible here to write in detail, but there is one which ought not to be passed over-his share in establishing the antiquity of man upon its present scientific basis. In 1847 Boucher de Perthes had announced the discovery that man was living in the valley of the Somme at the same time as the mammoth and rhinoceros, and that the fauna belonged to the period now known as Pleistocene. In Britain similar discoveries had been made by the Rev. J. MacEnery in Kent’s Cavern, near Torquay, in 1825-30, and these were verified by Godwin-Austen in 1840 and six years afterwards by the Torquay Natural History Society. They were, however, received with incredulity by the scientific world, both of France and England, until the exploration of Brixham Cave in 1858, carried out by a Committee of the Royal and Geological Societies, of which Prestwich was one of the prominent members. In conjunction with Mr. John (now Sir John) Evans he examined the evidence offered by the valley gravels of the Somme and of South-Eastern England, with the result that the contemporaneous existence of man with the mammoth and other Pleistocene mammalia was fully established by the year 1860, and the antiquity of man became one of the most interesting questions of the day. In his later years Prestwich held that the antiquity was small, rather than great, and brought it down to within an appreciable distance of the frontier of history - a conclusion not generally accepted by his scientific fellow-workers. While Prestwich devoted his main energies to the study of geology, he was led gradually, by the close connection which exists between that science and civil engineering, to inquiries of great practical utility in dealing with two of the most important questions of the day-coal and water-supply. He had mapped the coalfield of Coalbrookdale early in the thirties, and he followed up this research in later years by the study of Northern France and Southern England, along with Godwin-Austen. When, therefore, the latter published his views as to the range of the coalfields in Britain, from Somerset eastwards into Northern France, Prestwich fully accepted them. He was appointed a Member of the Royal Commission on Coalfields in 1866 and drew up two reports; one on 'The Quantity of Unwrought Coal in the Coalfields of Somerset,' and another on 'The Probability of Finding Coal under the Newer Formation of the South of England.' Godwin-Austen gave evidence and Prestwich confirmed it, taking the favourable view in opposition to his fellow-commissioner, Nurchison, who considered that there were no coalfields in South- Eastern England. The Report of the Commission has led to a large development of the mining industry in the areas where the coalfields are concealed by the newer rocks, in the Midland Counties, in South Yorkshire and in Nottinghamshire. It caused an experimental boring to be carried down to a depth of 1,905 feet at Netherfield, near Battle, by Henry Willett and committee, which proved the absence of Coal Measures to a depth of some 2,000 feet below the surface. It led to the selection of Dover by Boyd Dawkins for a further experiment, which, under the guidance of Sir Edward Watkin, has proved the existence of the South-Eastern Coalfield, that may sooner or later turn the Weald of Kent into a great manufacturing centre. The question of the water-supply to the metropolis has been to the fore from the third decade of this century and is still pending. In 1851 Prestwich contributed to it a work on the Water-bearing strata round London, which is the first systematic book on water-supply and up to the present time without a riva1. In it he has diligently collected the scattered observations of Robert Stephenson, Homersham and others, and combined them with his own researches and experiments. The principles which he lays down have not been modified by the discoveries of the last half century, although some of the details, such as the range of the Lower Greensand under London, now known to be absent, have been modified by later borings. In 1867 he took a prominent part in the work of the Commission on the Metropolitan Water-Supply presided over by the Duke of Bedford. In 1872 Prestwich retired from business and two years later he was appointed Professor of Geology at Oxford, which post he held until his resignation in 1888. While occupying that chair he published a work on geology in two volumes-notable as containing the best description of underground water, springs, &c., to be found in any book on geology-and these researches were continued on his retirement. In recognition of the value of his work, in 1849 the Geological Society gave him the Wollaston Medal and in 1865 the Royal Society awarded him the Royal Medal. In 1885 he was elected a Corresponding Member of the Academy of Sciences in Paris and in 1896 he received the honour of Knighthood. He closed his life surrounded by the warm affection of all who knew him, and has left behind a name which will live in the scientific annals of this century. Prestwich was elected an Associate of the Institution on the 7th of December, 1869, his proposition paper setting forth that“ by his scientific acquirements as a geologist he is qualified to concur with Civil Engineers in the advancement of professional knowledge.” In 1873 he contributed a Paper “ On the Geological Conditions affecting the Construction of a Tunnel between England and France,” for which he was awarded a Telford Medal and Premium, and two years later a second Paper, “On the Origin of the Chesil Bank, and on the Relation of the existing Beaches to past Geological Changes independent of the present Coast Action,” for which he obtained a Telford Premium. This page was last edited on 6 April 2015, at 07:59.